SAINT AUGUSTINE – Flagler College will host its eighth annual Flagler Creates! 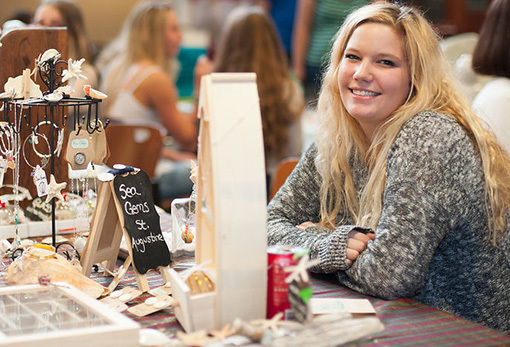 festival, featuring handmade items by the college’s students, faculty, staff and alumni on Saturday, Nov. 18. A portion of proceeds from participant donations will help finance student scholarships through the Flagler College Annual Fund. More than $6,000 has been donated to the fund since the event started in 2010. A variety of handmade items will be available, including artwork, jewelry, clothing, accessories, photography, wood working and prints. A special selection of handmade gifts will be offered for raffle. The event takes place on the same day a traditional lighting ceremony kicks off St. Augustine’s “Nights of Lights” celebration, and coincides with Flagler College Department of Art and Design’s 5thAnnual Block Party. Known as relief printing, Art and Design students in Professor Don Martin’s Printmaking class carve numerous designs on large, wooden blocks before applying a dark ink that can be transferred to canvases such as clothing, bedding or wall art. Guests are encouraged to bring up to two plain T-shirts to the event for their free, original block print. The community is invited to the free Flagler Creates! and Block Party events. Both will be held in the Kenan parking lot, located on the corner of Cordova and Valencia streets, from 11 a.m. to 4:30 p.m. Event parking will be available in the Markland House parking lot located on Markland Place.